People in Arizona communities are becoming more aware of their health insurance options through Project SHARE (Students Helping Arizona Register Everyone). Project SHARE, run by the Arizona Center for Rural Health (AzCRH), trains University of Arizona health sciences students as Certified Application Counselors (CACs) that provide information on enrollment through the Affordable Care Act (ACA) marketplace. 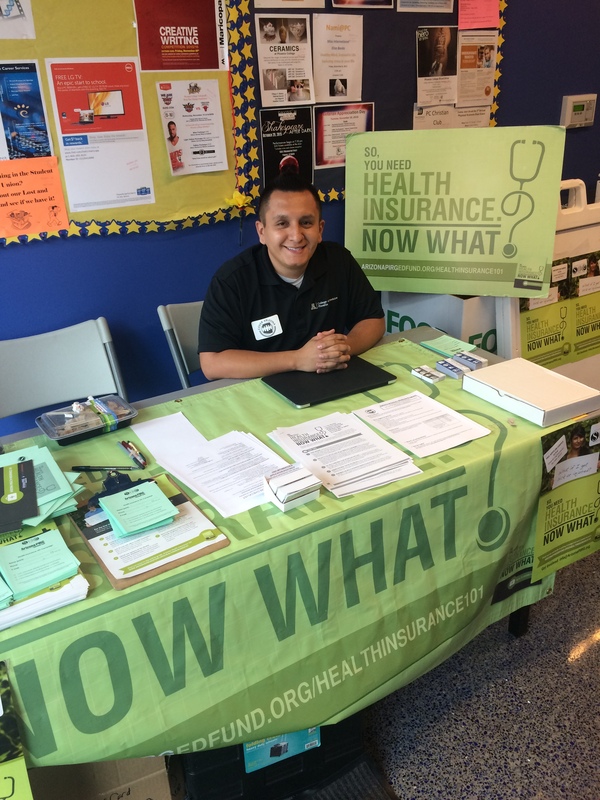 Alyssa Padilla, who supervises the SHARE program for the Arizona State Office of Rural Health (AzSORH) under the AzCRH, said that the program helps not just the patients but also the students, who become more rural and health insurance literate. “SHARE gives the students a better understanding of social support services and how to connect individuals with those services,” Padilla said. Through SHARE, the students earn volunteer credits that allow them to graduate with distinction. But, more importantly, Padilla said, graduates of the program “are better equipped to answer patients’ questions about coverage on the spot.” To become a SHARE participant, students take five to 10 hours of online federal training in addition to in-person session training, Padilla said. When surveyed afterwards, participants have said the program has given them a better understanding of the ACA, health insurance premiums and deductibles, and the value of expanding Medicaid in Arizona, Padilla said. 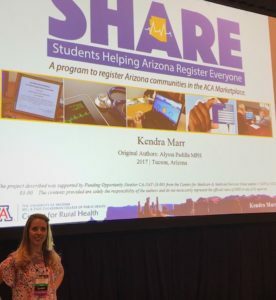 Kendra Marr, an MD/PhD student at the UA College of Medicine-Tucson and Tucson SHARE leader, said that another benefit she has found with SHARE is the “wealth of opportunities for collaboration with other clubs and services within the College of Medicine,” including the Commitment to Underserved People (CUP) health clinics. Marr has been working with the free, student-run CUP clinics to form a partnership so that SHARE can refer patients to them and vice versa, and has been holding her SHARE enrollment office hours at the clinics. Project SHARE has benefited the university as well. “The University of Arizona is a White House Healthy Campus because of Project SHARE and UA Campus Health’s efforts to improve access to health insurance coverage,” Padilla said. Right now, Project SHARE offers in-person, outreach, education, and one-on-one enrollment services in Pima County and in-person outreach services in Maricopa County, Padilla said. The CACs also can volunteer to staff the Cover Arizona phone number, where they answer insurance questions and schedule appointments for patients across the state. Typically, 15 to 25 students work for SHARE each year, Padilla said. So far, 90 students from the UA Colleges of Medicine, Nursing, Public Health, and Pharmacy have gone through the SHARE program since its inception in 2015. In her role with the AzSORH, Padilla oversees the licensing, recruitment, training, and mentoring of the SHARE participants. Most of the funding for the program comes from SORH grants, Padilla said, with small additional amounts of funding from UA College of Medicine CUP, which pays for things like food for the students during their trainings. Padilla said she hopes other SORHs will consider replicating Project SHARE. The AzSORH has created templates on the processes involved and how-to directions, which Padilla will provide to any interested SORHs. Meanwhile, Padilla said that AzCRH is planning to extend the reach of SHARE to remote areas of her state through partnerships with Critical Access Hospitals and rural faith-based communities. What are three life lessons you would share? 2. Look for continued challenges. 3. Exercise and eat right – but don’t give up the wine! services for residents of Santa Cruz County, Arizona aged 55 and older who suffer from chronic disease and/or have been identified as high-utilization emergency service users. They have been piloting this project and now we are trying to hone in on the appropriate outcome measures and the best data sources to properly evaluate the impact of the program. The diversity of our job is complex with the Tribes in our state and our borders. The questions I receive are challenging and there is never a dull day. I think the biggest challenge is keeping rural healthcare on the radar of legislators and business leaders. It is important to keep this issue front and center to emphasize how important rural is. We have to make rural healthcare a priority and continue to bring it to light. We need to continually explain what SORHs are and what they do by providing valuable technical assistance to the rural communities they serve. I have always been involved in volunteering in NOSORH committees. It is a great way to understand what the other SORHs are working on. I am the Region D Rep along with John Packham and I’m excited about it. Arizona is already seeing the benefits of SB 1353 that went into effect this past January. SB 1353 requires health care insurers to cover services provided through telemedicine, if those services would be covered if provided in-person. The AZ SORH helped make this bill a reality by providing information and data to underscore the need especially in rural areas. Dr. Dan Derksen, director of the AZ Center for Rural Health, explained that, “We helped inform the legislative process with workforce studies and identified areas of need. Several of these studies indicated that reimbursement for telemedicine services was the main obstacle to implementation.” The AZ SORH worked closely with the Arizona Telemedicine Program with Ronald S. Weinstein, MD at the helm to ensure that Arizona’s small, rural communities would be able to provide more services locally by using telemedicine. Derksen continues, “One small hospital, Copper Queen, located 10 miles north of the Arizona-Mexico border maintains a healthy fiscal bottom line by keeping business local and allowing them to diversity their portfolio of services offered to their community.” Derksen believes telemedicine is another tool to help hospitals improve fiscal performance. “Folks are no longer leaving the community to get services elsewhere. It helps keep the business local and allows them to diversify their portfolio. They can tailor the telemedicine solutions to enhance the services that are offered locally and improve the bottom line.” Copper Queen began by offering telestroke services a few years ago and has added telecardiology, teleneurology, teleconcussion, teleburn, telepediatrics and is looking to add teleorthopaedics. Cochise Regional Hospital in Douglas avoided bankruptcy and experienced a 180-degree fiscal turnaround by bringing in real-time medical expertise by way of videoconferencing, through a virtual cloud of physicians with a Chicago-based central hub. Rather than directly hiring actual doctors and physically moving their families, the experts telecommute to Douglas, thereby giving local residents the affluence that flourishing hospitals have access to. Cochise Regional is the first hospital in the country to have access to all these doctors’ presence at any moment’s notice and because the infrastructure is already there now, it can be deployed to another hospital in just a few days. The AZ SORH will use its convening function to continue this conversation at the 42nd Annual Rural Health Conference and the Performance Improvement Summit. They are distributing a book that captures the rich, oral history of the Center of Rural Health and preparing for a series of 10 minute talks to discuss the challenges with the Medicaid program, how to get better value out of payment, how to innovate such as testing a rural hospital quality pool, paying for performance across defined health outcomes, and reducing readmissions and healthcare-associated infections. “We are just beginning to see the benefits of this legislation and will continue to track access, quality and reimbursement issues for rural providers,” Derksen concludes. An online brochure, created by the Southwest Rural Policy Network (SWRPN) and distributed by the Arizona State Office of Rural Health, aims to provide quick and easy information on the Affordable Care Act (ACA) for a rural audience there. Feedback on the brochure has been positive, Hospodar said. “The momentum is increasing, more people are wanting it. It has been lauded for ease of use.” By popular demand the brochure is being translated into Spanish, and public service announcements are being written from it in both English and Spanish, which will be targeted for national distribution. Hospodar said that both the online and print brochure versions can be modified and used by other State Offices of Rural Health (SORHs), but it will require some funding for the modifications. The New Mexico members of the Health Action Team have tailored the brochure for their state and have made it available online. To access the Arizona and New Mexico ACA brochures, visit the SWRPN Affordable Care Act page. SORHs that are interested in adapting the brochure for their use can contact Hospodar for more information, at hospodar@email.arizona.edu or 520- 626-2432. Yet, Bergsma said, “when people like me from academic institutions try to help these wonderful, well-meaning rural health folks understand how to do program evaluation, we often make it so complex and overwhelming that we just confuse them, and they give up before they start.” She gave an example of a university researcher, who visited a county cooperative extension office to explain program evaluation, but many staffers said afterwards that they were more confused than when they started; one staffer was so overwhelmed she was in tears. To help in that effort, the AZ SORH hosted a webinar in March on “How to Develop Logic Models for a Strong Program Evaluation,” the second in a series of webinars on project funding opportunities. The webinar was the beginning of what Bergsma hopes will be a new and continuing interest in logic models. In addition, the AZ SORH will provide some ongoing technical assistance to those who have participated in the webinar. Although it has been geared for an Arizona audience, Bergsma said that anyone could view the webinar (click here) and use the takeaway for logic models.